This year, I decided that some time away from the city was in order and headed out to my parents' in Guelph; just under an hour south west of Toronto. In my family, the cooking roles are not the traditional ones; my father has been the main cook in their home for the last fifteen years. This weekend he told me that he has decided to start his own cooking blog "Cook-Issy" and try to cook something he had never tried before; corned beef. The beautiful thing about my father's cooking style is that he's never been formally trained as a chef like me and as such he has no limits in the kitchen. He freely combines cooking techniques and ingredients coming up with many winning combinations and this time decided to roast the corned beef. My mother happened on a fluke to have some cabbage in the house so I decided to do my part to come up with a classic combination for the corned beef. 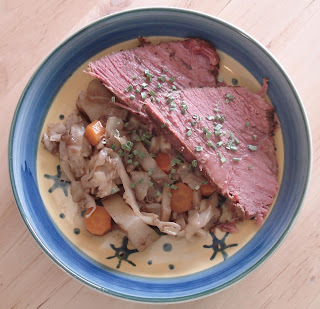 Please see my Dad's blog for his lovely Roasted Corned Beef. Mix everything together in a large bowl and taste for seasoning. Be careful about adding any salt given the saltiness of the beef. Add to the corned beef about 3 1/2 hours through the cooking at 200 F; cook for an additional 2 1/2 hours. Though this cooks for a long time, this is a great recipe that requires little monitoring throughout the day. Once the beef was out, we carved it like a roast and ate it with the cabbage on the side but it would be amazing on a sandwich with the cabbage as a form of sauerkraut. A lovely dish. Love the ingredients.